GearGuyd > Home > Flintstones Sour Gummies Vitamins – Yes They’re For Adults Too!! It was always the same story – I would make a conscious effort to take an adult vitamin once a day, and this would usually last a week or two before I forgot a dose. Then another day goes by. And then a week. One month. Two months. A year. Finally, I find the bottle under a pile of clutter, only to see that the vitamins have expired. 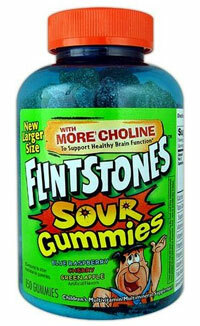 I’ve actually been doing well recently with these Flintsones sour gummies. Yes, I know, it’s a “children’s multivitamin multimineral supplement.” An adult dosage is two vitamins. I compared these to the adult gummies on the shelf, and found little difference, except the adult versions had a few more chemicals (aspartame! ), and a higher price. The vitamin levels were seemingly comparable, and the adult dosage were also two gummies. I’m on my third sour gummies bottle and recommend them. The gummies do get a little stale and slightly tougher over time, but not oppressingly so. The only downside is that they don’t really taste sour at all. My wife does something similar. She takes prenatal vitamins instead of a regular multivitamin because they have all the same stuff and are less expensive. But one should be careful because children & adults (as well as men and women) require different levels of certain vitamins and minerals. In particular, a lot of children’s and women’s vitamins contain extra iron which can be toxic to men. In fact, it wouldn’t be a bad idea for men to get their iron tested as too much can lead to cancer, heart disease, and other illnesses such as endocrine problems, arthritis, diabetes, and liver disease. I checked the Flintstone’s site and didn’t see iron listed on the ingredients of any of the Gummies — although it was listed on some their other vitamins. I didn’t know about high iron levels, and will keep that in mind! I have actually switched to One a Day vitamins for the time being. An adult dose/serving is also 2 gummies, but unless I read the labels wrong when I switched a few months ago, it looks like they deliver double the vitamin amounts. Once my busy schedule settles and my diet returns to normal, I’ll switch back to the Flinstones. Although, it would be preferable if I tailored my diet so that I didn’t need any vitamin supplements at all!